Aloha and welcome to our career listing for Marine Corps Community Services Hawaii. MCCS is Windward Oahu’s largest employer, providing overwhelming support to Marines, Sailors, and their families at locations aboard Marine Corps Base Kaneohe, Camp Smith and Manana Housing. We believe that YOU may have the right dedication to customer service, the right attitude, and the right entrepreneurial spirit it takes to join our ohana. We invite you to learn more about us by viewing our website, and once you learn what a wonderful opportunity we can offer you, please consider employment with our organization by applying for positions we have listed below. 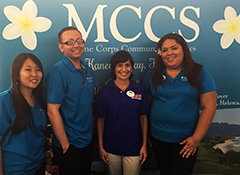 Mahalo from the employees of MCCS Hawaii! MCCS uses an advanced applicant tracking system for both internal and external job applicants. To view Hawaii job listings, click on the red button below to get to the MCCS Civilian Careers Page. Then, under “Recruiting Location”, click the “Hawaii” tab and you will see our list of open job vacancies. Click on the job you are interested in and navigate through the screens. We look forward to meeting you! NOTE: When uploading files to your profile, please upload Microsoft Word documents only. Spouse Preference requires a copy of the active duty member’s orders with the spouse’s name listed. Effective 7 Oct 04, Spousal Preference applicants hired in a flexible position will not lose their spousal preference eligibility until transferred or hired into a regular Full-Time or Part-Time position. If you are eligible for spouses preference, please fill out this Spouses Preference form and turn it in to the MCCS Human Resources Office.